It’s full of the colors I love and the products I love and the most appropriate image for my BFF. Best wishes for the New Year to you! The light at the end of my crazy busy tunnel is coming clearer for me .. this is my last X’mas card for the season and I’m done with my X’mas mailings for this year! Thank goodness – 5 days to X’mas! DS’s birthday is tomorrow – so let me get through that 1st before I wish you all Merry Christmas! But Happy Birthday to my dear Shawn! Well – this card has some of my favorite things on it – stickers and die cuts! All from Flower Soft and they all just pop out of the paper crafting kit (well the sticker was from a sticker sheet) and I was able to assemble it in no time at all. Check out how my team works with the other fun stuff that Flower Soft carries. How have you been? I’m still digging myself out of 12 inches of snow this past weekend, birthday invitation cards/thank you cards for my 2 kiddos birthday and lots of Christmas cards. Present? Not even started shopping yet! But I do have a beautiful and peaceful card for ya today – hopefully, it’ll allay my panic and anxiety attacks every holiday season! Tree sticker and sentiment stamps are from Flower Soft. Love calming and beautiful cards that I can do in 10 minutes or less! Hope your holiday season is less stressful than mine is. I have to say that one of best thing I like about being a part of the Crafter’s Companion design team is that, I get to play with tons of products and not just stamps! Today’s card that I am sharing has images and paper from the Mulberry Wood Everyday CD collection. I love my stamps and ink but let’s face it, the busy holiday season sometimes gets in the way of happy crafting time. This CD contains thousands of printable element from background papers, borders, tags, toppers and so much more that I can make this card in 10 minutes or less. All I did was print out a topper, stamped on the sentiment – from Popcorn the Bear Winter Wishes, added some textural “snow” – from Flower Soft and from Stampendous, slapped on a twine bow and add it to a patterned paper card base. Card making has never been easier until now! I hope you have all your Christmas cards made or almost done and have a warm holiday season! 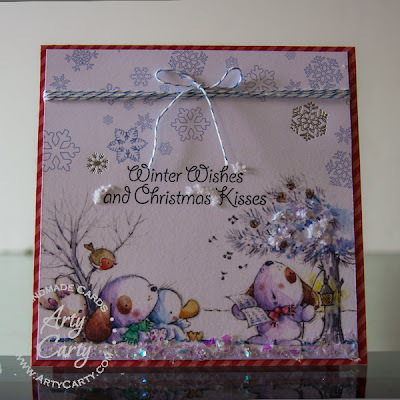 Welcome to another Flower Soft post and this week, we are partnering with Card Maker magazine. I wanted to share a timeless Flower Soft classic – the ever adorable Hedgerow the Hedgehog. He is a card topper so there was no coloring involved but I did use Nutbrown Flower Soft for his texture and Toffee Flower Soft for shadows. Patterned paper is from Simple Stories. You r my Thanksgiving Blessing. Happy Turkey Day to my American Friends! Many thanks for being in my online life as well as my real life – card is made with Flower Soft products. Specifically, Mabel Lucie Atwell Papercrafting kits and Autumn and Lavender Flower Soft. I hope you have plenty to be Thankful for this year and may you gobble till you wobble! I cannot shake the chills from the sudden temperature dip this week! So I made a snowy card .. I mean why fight it – I live in MN and it’s only getting colder. The green backdrop is actually Flower Soft’s fairly new product line called Winter Wonderland Card Creator, Santa and stamp is also Flower Soft’s Silhouette line of sticker and stamp and I used Polar White Flower Soft for the snow. Let it snow! I know I’ll be having fun with it once I get over my initial shock. Totally love the sentiment and the matching images – courtesy of Flower Soft’s brand new Wine Buff stamp collection!! Patterned paper – Lilybee Design. Are you in the mood for some Christmas Spirit? I made something different today! I used a card topper but I didn’t make a card or a layout. For my own sanity – I made a post it note holder for my purse. I’m usually one of those who throw a pad of Post-it Note in my purse and by the end of the day, all the stickiness is gone and the paper is stuck everywhere in my purse … aargghh. So I made a holder for it. I used one of the new Flower Soft product – Multi-function Die Cut Cards to make the holder – scored it at 3.75″, 4″, 7.5″, 7.75″ from the bottom of the card. After folding it, I decorated the back panel with patterned paper from Basic Grey and airbrushed the front with my Copic markers and decorated it. Hey, it’s got to look pretty too – I used the scenic window topper from the start kits and I like that it stands as well so I can admire it when it’s out of my purse and on my desk. I know – I have another pad on my desk but sometimes, I just want the writing on that one in my purse . New Flower Soft color alert: Autumn. See the post it on the other side. I had to take a top view so I could show some perspective – it looked odd to just see a front view of the post it note. I had tons of fun creating something new from an older kit. Welcome to another fun Flower Soft blog hop! This is my favorite all new Flower Soft product yet … I’ve got 1 to show for it today but it’s been such an hot item in my house, the 2 others in the package are already gone as gifts! It’s more than just a frame to embellish – it’s a instant craft in a bag! My kids love it, my neighbor took 1 for her disable sister to work with – well there was only 3 in a pack.. I wish there were 10! My frame was painted with black gesso over a thin layer of Viva Deco Inka Gold and sprinkled with Flower Soft glitter frosting (Hint of Violet). It was meant as a gift so I added the focal image, embellishments and a bottle shaped card from the Wine Buff collection. Your next stop is Dawn’s blog and she decorated it with paper and embellishments with a photo so she could display in her home – oh the endless possibilities!!! I LOVE it!! Yup – everything I used on this card from background paper to focal image to sentiments are all from 1 paper stack!Convenient isn’t it – and it’s all professionally paired and matched for you to just focus on your layout. Welcome to another fun Flower Soft blog hop! There has been much exciting happenings with this company lately, I can barely keep up! And did you know Flower Soft now makes stickers too – Booyah! The one I used for the sentiment is called Die Cut Silhouette Stickers – Santa and there are all 8 different collections of stickers! How convenient and in such a beautiful and decorative font. Background paper is from Echo Park. Psst…did you know Elizabeth Bell has now also signed a licenced agreement to produce her lovely images for Flower Soft products to create a range of papercraft products which include, Stamps, CD’s, Card Toppers™ and Card Making lines later this year. Take a look at some of her images..
We just returned from our monthly long Asian adventure. I’m jetlagging and up at some odd hours of the night. Tonight, I just realized I have not played with wires in a long while – Flower Soft wires that is. So I decided to make a good old fashion bouquet of Flowers with it. It’s right there – stuck in the bicycle basket. But I wanted to direct your eye to the pots of other flowers you see – those are the new Flower Soft colors just released last week at CHA – specifically, Orange Blossom, Burgundy and Citrus Crush… oh so delicious! Papers are from Basic Grey, the garland is from Little Yellow Bicycle and the image is a Flower Soft card topper! I’m off to see if I can get some sleep! True confession time … I am a paper junkie, card stock, patterned paper, scrap paper, post it note paper, toilet paper (oops – didn’t think you noticed) – I LOVE paper period. DH thinks my studio is a fire hazard and the stamps only serve as fuel! LOL – I just love being in my paper haven. This one I dabbed on with a stippling brush. Dip my brush into many colors and twirl it on the cardstock. Well I stamped it after that, punched it and sewed on it too! Followed by some wet embossing .. you can’t do too much with cardstock! Project #2: Cut and emboss. It’s paper – how can you not cut it! I die cut a big ole’ hole in the middle and embossed the heck out of it. I love the colored core of the Core’dination paper I used. It brings out the design so much more! Oh I wish I had some of the kraft core paper but my Archivers or LSS didn’t carry them..hmm. Project #3: Score it and sand it. Well, actually I didn’t want to score it by hand so I ran it into the crimping machine (which I cranked by hand … does that count?) and sanded it to get the way COOL score lines! It sure made lining up the sentiments so much easier. If you love paper as much as I do – head on over to Core’dinations and get the amazing variety of colored core cardstock that you can humanly manipulate! It’s not just Christmas in July ..
It’s a giveaway too!! Santa’s here for this blog hop party! Anyhow, not to keep anyone waiting much longer… We are introducing Flower Soft Die Cut dimensions – Christmas Poinsettia. In case you’re not familiar with the Flower Soft Diecut Dimensions product line – they are card toppers that pop out! How cool and convenient they are! The image itself is a card topper and the poinsettia petals pop out to give the card a dimensional look. Here is a side view of the card so you could see the dimensions from the diecuts. What do you need to do to be entered to win? Here is your map ..
Have has your summer been? We’ve spent the 1st week and a half of our vacation in Singapore and currently in Hong Kong! I’m all topsy turvy right now with jetlag, the 12 hour time difference and such … so it’s no wonder I’m thinking now is the time to post some X’mas cards! LOL … and this week’s for my Flower Soft post, we’re starting with Christmas in July round up! I used Flower Soft Christmas Traditional card topper, sprinkled some Flower Soft on the wreath and plants. I also had some Stampendous glitter mix among the Flower Soft sprinkles in the plants – I love that the Stampendous glitter mix is so chucky that you can still see it and doesn’t the glitter give it such a Christmasy feel! Patterned paper and sticker banner are from Echo Park, the sentiment metal plate is from TPC Studio. Have a good one and stay cool! We’re in the air right now – literally, on a plane for our Asian vacation. I’m bummed I’m missing 4th of July this year – we usually participate in an “elaborate” kiddo bike parade and a picnic dinner with watermelon involved, followed by some adult fireworks. Real fireworks with some adult friends while the kiddos get to bed – you get your mind out of the gutter! Since I’m missing 4th of July, I made a 4th of July card with a sneak peek of the new Flower Soft color – The Patriot – releasing this summer CHA!! My stamp is from Gourmet Rubber Stamp and paper is from Authentique paper. I penciled in a flourish, stamped and embossed my sentiment 1st; then I swirled some Flower Soft glue on the penciled flourish and sprinkled Flower Soft on it!